This challenge runs from November 1 2008 - November 1 2009 and sounds like lots of fun. 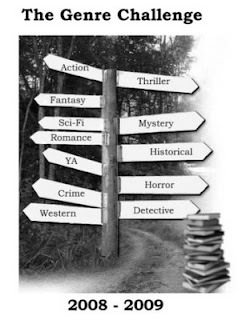 To read one book in at least 10 of the following genres: crime fiction, detective fiction, mystery fiction, horror fiction, thriller fiction, romance fiction, science fiction, action/adventure fiction, fantasy fiction, realistic fiction, historical fiction, and western fiction. Specific definitions of these genres can be found in this post. The rules can be found at the sign-up post. I'm still not totally sure which category you're going to do, as you seem to have the full list here, but mention in your comment that you'll probably only read 11 books, leaving out the one you don't like (in which case, you should go for 10 books, because 11 is where you only leave out what you read most). Could you let me know so you're eligible for prizes? I've got you down for 12.